Last updated: 4th Apr 2019. Thank you for purchasing our plugin. If you have any questions that are beyond the scope of this help file, please feel free to email via contact form here. Have fun! Always backup WordPress database and files before updating to latest version, just in case! If you override default and use custom templates in your_theme/woocommerce/ you need to make sure that templates are updated with those in plugin_dir/templates/ - otherwise some new features might not show up on the site. 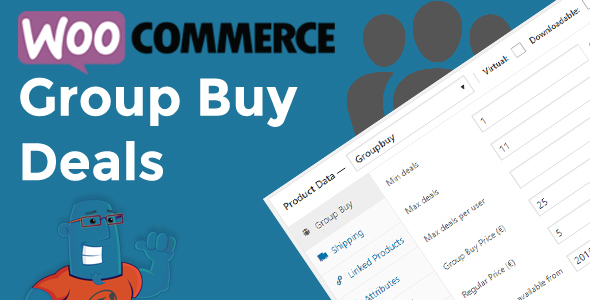 WooCommerce Group Buy is a extension for popular WooCommerce plugin and extends it with group buy / deals feature. 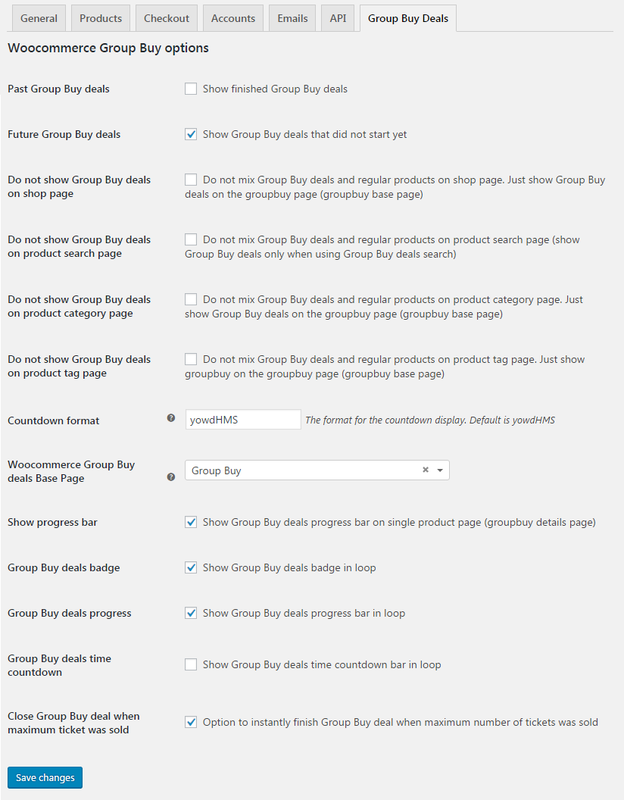 This extension allows you to implement powerful group buy solution like Groupon. Woocommerce Group Buy is easily setup and customized, and you need basic Woocommerce and web developing knowledge. With WooCommerce Group Buy plugin you can setup WordPress deals (group buy) website in less than 30 minutes (assuming you have payment processor allready sorted). 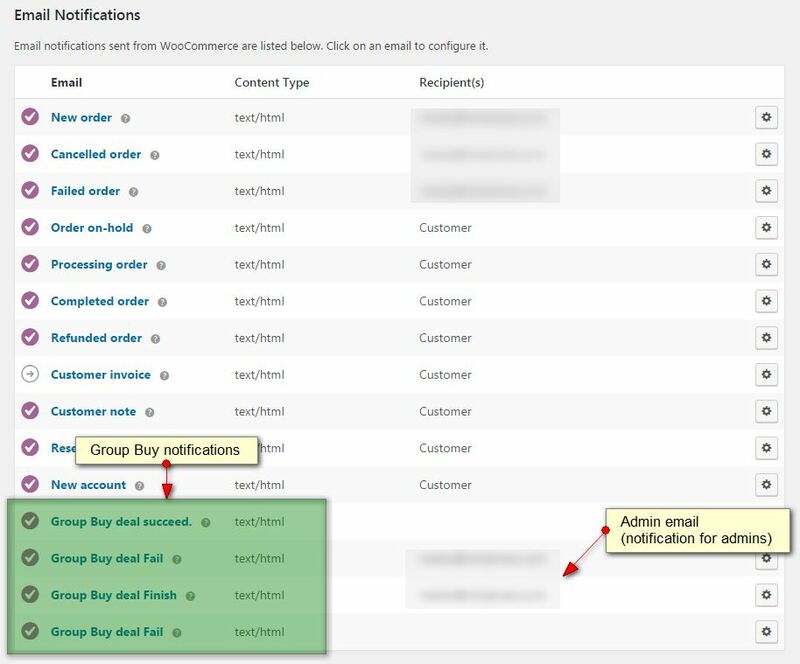 WooCommerce Group Buy plugin integrates seamlessly with WooCommerce and no special knowledge is needed (same level like for standard WooCommerce usage). Group buy product single page has new tab "Group Buy History"
Make sure to install WooCommerce before you activate WooCommerce Add to Cart button manipulation plugin. You can install plugin via WordPress "Add New" plugin - to do that download zip with plugin only, click add new and that's it. In case you do not have permissions to upload to plugins/ directory you will need FTP login info and upload plugin via FTP. Alternative setup. After downloading WooCommerce Group Buy plugin, extract plugin zip and upload it to your plugins directory - wp-content/plugins/ folder of your Wordpress installation. Since this is extension for WooCommerce you need to install WooCommerce before activating the plugin. WooCommerce plugin which can be downloaded here. Once you installed and activated WooCommerce go to WooCommerce > System Status and make sure that you don't have red colored errors (specially for WP memory limit). Make sure to enable inventory management in WooCommerce! 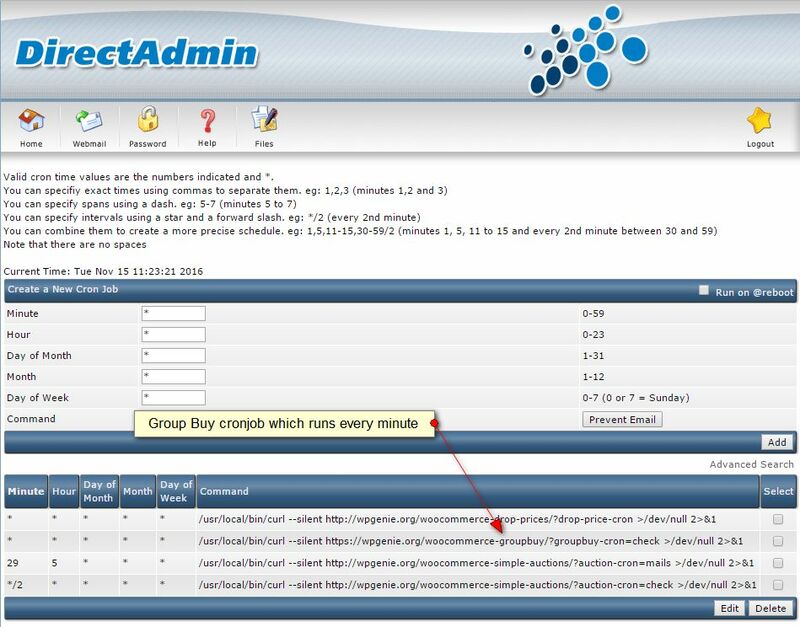 More details about cronjobs can be found by googling "how to add cronjob in cPanel / DirectAdmin". If you don't know how to add cronjob the best and the easiest way is to email your hosting support to do it for you (purpose of hosting support are tasks like helping you with cronjobs, our support helps you with plugin issues - cronjobs are hosting related task / issue). If your hosting company does not support one minute cronjobs we suggest that you move your website to more serious hosting company or use service like EasyCron. We cannot use WordPress cronjobs because they are not reliable and depend on visitor accessing your website. In order to have reliable way to end and finish group buy / deal you need real cronjob. Our plugin is meant to be used as ecommerce solution which will / should earn money so we suggest you to invest in proper hosting (which at least supports one minute cronjobs). Importing dummy data can take some time, specially on slow Internet connections. Be patient and do not close or refresh browser tab until import operation is completed. 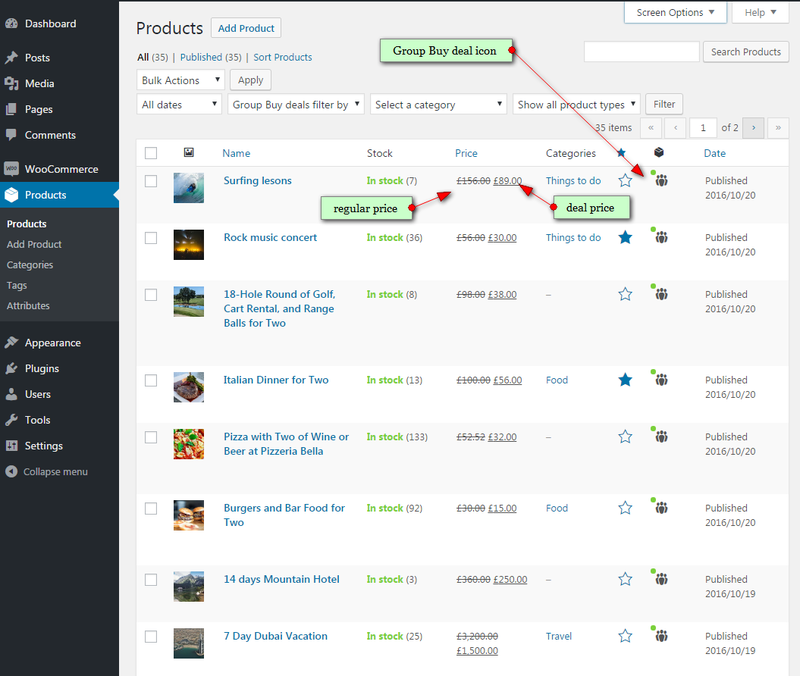 In Woocommerce Settings -> Group Buy you can set group buy base page where your client will have a list of all group buy deals. Please see note if you want to set your group buy page as home page. If you have group buy only website there is no need to setup group buy base page, you can use Woocommerce shop page. Make sure that when setting up group buy site your group buy base page is different than your home page. If you need deals on home page use shortcodes or widgets to display them on your home page. Here are settings that you can turn on and off. Settings are self explainable. You can enable or disable showing past and future deals. Another useful setting is whether to mix regular products with deals or just show deals on separate page (defined via deals Base Page dropdown, see screenshot). On screenshot below you can see how product list with deals looks like. Group buy status icon colors: green - active group buy, orange - finished, red - failed. If group buy has failed, in product / group buy details you will see "Refund" link which enables you to refund all tickets to participants if your group buy rules require that. If you leave option "max deals per user" unregistered / guest users will be able to purchase deal(s). Plugin comes with 4 email notifications, 2 for admin and 2 for users. In fact there are 2 different email notifications - deal failed and deal succeeded. You can edit those by going to Woocommerce Settings -> Email tab. On screenshot below you can see all available options for WooCommerce Group Buy Deals. To edit settings you need to click in your WordPress wp-admin on WooCommerce Settings then find Group Buy Deals tab. Here is a list of all available plugin shortcodes. Some shortcodes accept optional orderby and order attributes. Please note that there is no paging when you use shortcodes (same as with WooCommerce shortcodes). Per page attribute means how many items will be displayed on that particular page without paging! Here you can find answers to frequently asked questions. Feel free to contact us if you can't find answer to your question. Is user registration necessary? - No, if you skip entering "max deals per user" option. If you need that option then user registration is needed because we do not have reliable way to track number of deals per user. I want to instantly finish group buy deal. How can I do that? - You need to change end date timestamp to current time and group buy deal will be instantly finished. Can users create their own deals? - Basically yes, only users who can add new products can create deals. 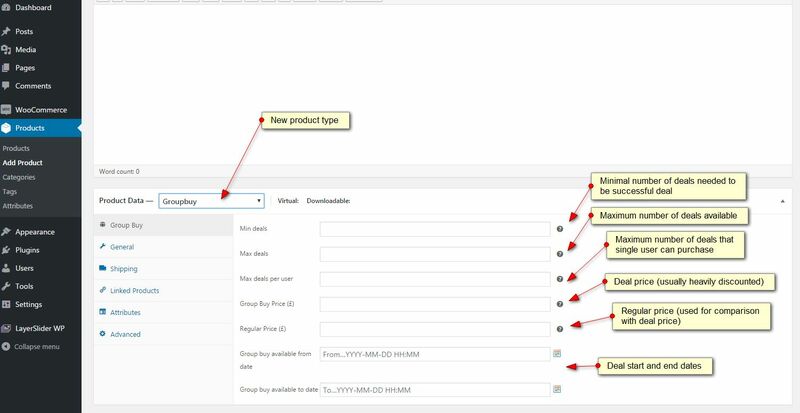 You can use multiple vendor plugin which will allow you to add users who will be able to create products (deals). You can use WooCommerce Product Vendors (there is no frontend submission for group buy / deals). Do you use cronjobs? - Yes. Please check installation instructions. Where can I edit email templates? - Go to WooCommerce > Settings and click on Emails tab. You cannot provide an Item Purchase Code for your customers - Since Envato doesn't have a "multi-use" or transferable license, your customers are not entitled to receive an Item Purchase Code with your theme and use the plugin separately from your work. How can I update plugin with new version? Is auto updating possible? - We suggest you to install Envato Marketplace (installation instructions can be found on plugin's url) plugin for auto update plugin and themes purchased on Envato. Setup is easy. Manual updating can be done by downloading new version of plugin and overwrite old files with new ones or deleting old plugin and installing new one. If you have modified plugin files (templates) then you need to be careful when updating so you don't overwrite changes you made and that templates are inside child theme or theme woocommerce/ template folder. Does WooCommerce Group Buy work with WordPress import / export tools? - Yes, you can export and import deals with standard WordPress import / export tools that are located in Admin -> Tools menu. How can I enable user registration on login page? - You need to enable that feature in Woocommerce settings. I have installed your plugin but images are not aligned, buttons are too small / big, input fields needs to be smaller / bigger, can you help? - In short no. It's your duty to modify plugin template to match your style and theme. Themes can implement different ways how they customize pages and parts of Woocommerce. We cannot guarantee that our plugin will look same as in our demo for every possible theme out there. Web developing is more than getting a theme and couple plugins, enabling them and deliver web site. Our templates are coded by standards and they adhere to WordPress and WooCommerce template structure. That means that minimal intervention is needed from client side, but sometimes there is no way to avoid template changes. Some themes use similar structure and have minimal interventions in structure and our plugin looks good out of the box and some do not. It's your task as web developer and client who purchased plugin to modify and customize plugin templates to match your own (or client's) needs and styles. This is part of developing a web site. You cannot expect that everything will be perfect for every possible theme and plugin comibation out there or that we will do your job for you as part of support. We support plugin - we do not style and customize client's sites. Thanks for understanding. Right way to customize plugin's templates is to copy contest of plugin_dir/groupby-for-woocommerce/templates/ directory to your_theme/woocommerce/ directory and do modifications there. Can users buy deals without signup / register first? - No. It is impossible to have users purchase deals before they're logged in because we can not count consistently their previously purchased deals only those in cart can be counted. 3rd party plugin is causing problems? Its developers tell you that we need to fix our plugin? Woocommerce extensions should be transparent - meaning one extension should work with another without introduction of special code that makes them compatible. Imagine what would happen and how much time we would need to spend if we would have to add a bit of compatibility code for every Woocommerce extension that's out there - we would end up in huge plugin with tons of problems which would be problem to test and debug. That's why we think every plugin developer should stick to Woocommerce coding standards and APIs (they're there for that reason) and not require 3rd party developers to code something into their extensions / plugins so that it could work with theirs. How can I translate plugin to my language? Do you have translations? Order has been canceled but I still see same deals sold and status bar does not go back to previous or zero value. What should I do? This happens only if order was completed and then cancelled. In that case purchases have been logged and you need to go to edit product -> groupbuy History block and manually delete entries that have been cancelled. Does WooCommerce Group Buy and Deals work with your WooCommerce Simple Bulk Discount plugin? Yes, it works fine in combination with WooCommerce Simple Bulk Discount plugin. I do not see group buy progress bar despite enabling it on single product page? End value on progress bar is missing? This happens when you don't enter max number of deals. Just enter same number as min number if it is not different than minimal number of deals and that will sort these issues. Refund feature does not work? How can I tell if my payment gateway supports refunds? If you got this error: "Payment does not support refund" your gateway just does not implement refund feature. Here is link for more infos about how to check if gateway supports refund feature. Keep on your mind that for issuing refund you need to click on refund button in product details, there are not automatic refunds. I want to export order(s) data. How can I do that? - There are plugins that allow exporting of various order data as CSV file which you can then import to some other software you use for order management. We can suggest you to use WooCommerce Customer / Order CSV Export or Advanced Order Export For WooCommerce. These plugins work with custom product types which are used in this plugin. Do you recommend any credit / wallet plugin for WooCommerce that works with this plugin? - Yes, you can use WooWallet plugin which adds new credit payment gateway and works with our plugin just fine. Users or admins can top up wallet credit balance with regular payment gateways or manually. This plugin is created by wpgenie. Check out our Envato profile where you can support us by purchasing our plugins, give us feedback and post your ideas and feature requests, ask for support and rate our items. Check out our free stuff. We do WordPress developing, plugins for WordPress & WooCommerce, eCommerce sites based on WooCommerce, WordPress performance optimization and managed WordPress hosting.